Subject title: How to make a Good Composition for this? with a good composition for this one? and in the background you see the unorderly room with boxes of pizza on the ground etc., maybe a sofa and or a bookshelf on the wall behind. here some sketches, how would it be better? Play with camera angles. The first and second thumbnail are basically the same but mirrored and the third is a less closeup shot of the second. Also they are all with a flat camera angle, in front of the subject(s). Try having the "camera" in other places around the space and try different angles (bird's eye, worm's eye, etc.). Another thing to think about in composition is the placement of values. A good value read in a thumbnail can translate to a good value read at full size. Also value is very effective at leading the eye. Try to play with contrast to lead the eye where you want the viewer to look. Audiazif wrote: Try to play with contrast to lead the eye where you want the viewer to look. Where should I possibly want the viewer to look and why? I want them to see the whole picture, not a particular detail, i guess. why would the order be important? how do I know if the hierarchy is good? Can anybody tell me how to convey what I want to convey? It shall be a guy sitting in front of his computer drawing on his graphic tablet. He is relatively `normal` but just the camera angle and style how he is drawn shall make him/it look a bit crazy. for example with a distorted camera view where one of his eyes is bigger because fish-eye-lense or how its called. I dont get good looking thumbnails.. Unfortunately I don't think there is much that we can say to suddenly enable you to draw this. If I understand correctly what you've been describing, then that's a pretty difficult illustration to pull off. You either know the composition and perspective well enough to do this, or you don't. One thing I'd say is that you need to put way more effort into your thumbnails. The thumbnails that you've posted, seem to have been abandoned before you even got to the stage at which you'd try to solve any issues they have. 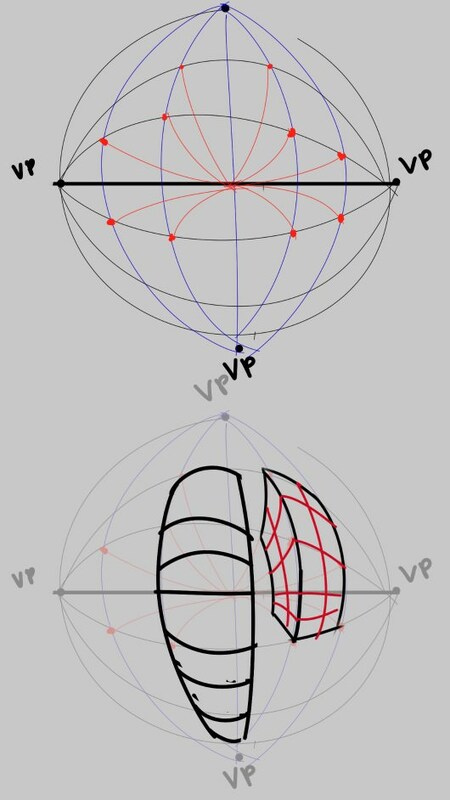 And if you want to do a fish-eye lens or some other crazy perspective, then I'd recommend that you start off with creating a perspective mesh for it. As trying to freehand it without having any experience is just not gonna work. I've tried making 2 thumbnails for this, but I'm not sure if it was a good idea, since it's supposed to be your drawing. So I'll put it in spoilers. svarn wrote: Unfortunately I don't think there is much that we can say to suddenly enable you to draw this. If I understand correctly what you've been describing, then that's a pretty difficult illustration to pull off. What is the best source to learn how to set up perspective grids and especially where to set the flight points. Thats one problem for me here, where to put them, how much of the wall in the back should I show etc. Just setting up the whole room `technically`, step-by-step, instead of making a sketch from feeling. Not sure about sources, I've learnt most of the perspective from my dad and when I was studying architecture. I've never really studied the warped perspectives, as I don't really have use for them. But I think it's just much easier to pick up, once you have a solid grasp on the normal perspective. So normally you'd want your vanising points far far off the canvas. But the closer together you push them, the more distorted image you'll get. Which is something you want in this case. For a thumbnail, doing a quick freehand mesh is totally fine, it's there just as a guide. And of course the lines will turn into arcs instead of beeing stright. As for the "correctness" of things, like "how far in the back should the wall be" etc. In a warped image like this, you can probably get away with murder. You could construct it properly, once you have a composition done. Here's an example of a quick mesh. I've used a similar one for the 2nd thumb. @azarga: Did you mean to post that here? Doesn't have anything to do with the topic so I'm going to delete it unless there is a good reason for it. LK Crown wrote: What is the best source to learn how to set up perspective grids and especially where to set the flight points. Thats one problem for me here, where to put them, how much of the wall in the back should I show etc. Just setting up the whole room `technically`, step-by-step, instead of making a sketch from feeling. So I assume what you mean by the "composition" is the design of the objects on the page. If that is correct, i think you may be having trouble from the start by doing your thumbnails in line-drawings. To focus your energy initially on setting up the objects in an appealing way, I suggest using a big ol' brush and just blocking things in before getting caught up in all the other intricacies. 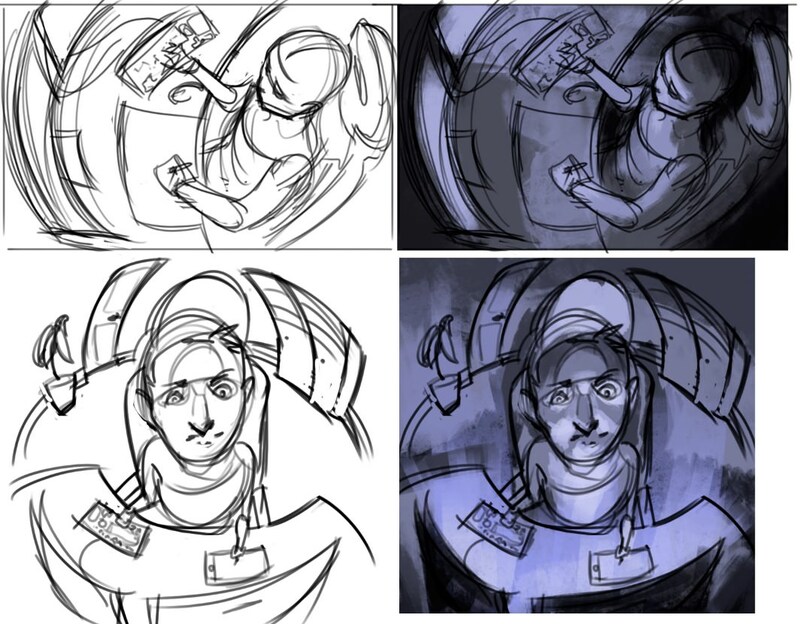 You can use different opacity/values to also put down an idea of what is foreground, mid-ground, and background. Once that is out of the way and you've picked a thumbnail you like (which you should have done several with variations) then you can start focusing on throwing down some perspective for large, simple shapes, and then detail it from there.